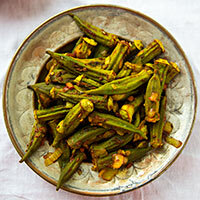 Tender, young okra are roasted and then combined with a spicy Indian masala for an excellent vegan side dish. Next to vine-ripened tomatoes, the vegetable I look most forward to in the summer is okra, small, tender okra pods that are impossible to get during the winter. Frozen okra is fine for gumbos and stews, but only fresh okra will do for my favorite way to prepare it, roasted. It’s as simple as putting it in a hot oven and letting it cook, but the flavor and texture belies the easiness of the preparation. Even people who don’t usually like okra will eat it like French fries when it’s roasted and seasoned. So the other day, I was fixing Dal Tadka for dinner and needed a side dish. 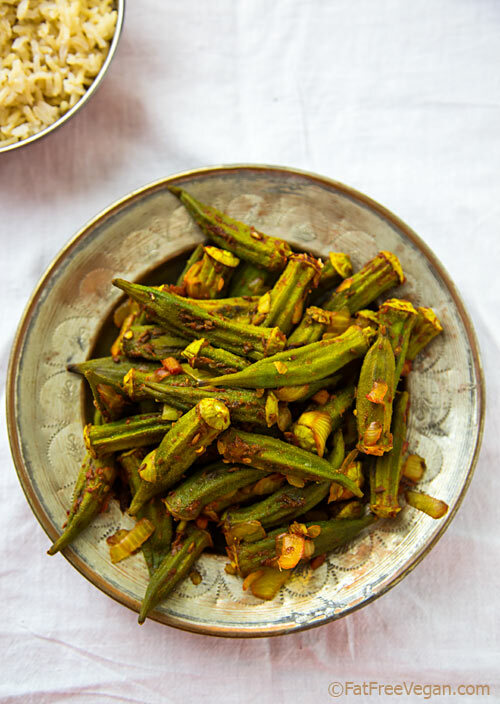 I’d just bought some okra that I’d planned on roasting, and I briefly considered using it to make my old Bhindi Masala recipe. But these okra were young and tender, perfect for roasting, and I couldn’t bring myself to cut them up. So I sort of combined the recipes. I roasted the okra while I prepared the masala, or onion-spice mixture, and then added the okra once it was done. The results were sublime: the smokiness of roasted okra with the flavor of onion, ginger, cumin, and pepper. Fun fact: Baking soda will speed up the cooking of the onion, but it reacts with turmeric, causing the turmeric to turn red instead of yellow. Preheat oven to 450. Trim the stems of the okra if they’re longer than a quarter inch. Place okra on a baking sheet in a single layer. Bake for 15-20 minutes, stirring halfway through. Okra should be beginning to brown in places but not burned. When the okra is almost finished cooking, heat a large non-stick skillet over medium-high heat. Add the chopped onion and a pinch of baking soda, if you want to speed up the cooking. Cook until onion begins to soften and then add the ginger root, garlic, and cumin and cook for another minute. Add turmeric and garam masala and cook for another minute, adding a tablespoon of water if the spices start to stick. Add the roasted okra and salt, if you use it, stir well, and cook for another minute or two. The original Roasted Okra recipe–don’t miss it! Love okra but don’t cook it nearly enough. Thanks for the tip about the onion- that one’s new to me! My favorite recipe is Okra Etouffee, page 99, in the cookbook I produced for my boss, “Cookin’ with Queen Ida”. (http://www.amazon.com/Cookin-Queen-Ida-Revised-Edition/dp/0761500065) It tastes best when you play the eponymous CD while you cook. The great thing about roasting is that it completely gets rid of the slime. I hope you’ll give it a try! Okra is new for me. I mean I’ve never had it or at least I don’t remember. Thank you for sharing. I like to try new things. I have to admit that I have never cooked okra. Yours looks delicious and I just might have to give it a try. This looks wonderful! If I ever get lucky enough to find fresh okra up here in northern Idaho, I’m trying it!! Absolutely beautiful photos too. Such texture and color! Looks great and I am excited about a new way to try okra! Wondering if it’s my mobile version, but don’t see the link to garam masala. Thanks! My Mother used to cook okra (being the Southern Belle she was) for us but it was always slimy and I hated it. I have not had it since because I cannot get that taste and texture out of my mind. I have copied your recipe and put it in my file and at some point I will try it, but I’m in no hurry! The picture is pretty and I’m sure the dish would be much better than Mom’s way so there is hope! Thanks. Do you believe I have never had fresh okra! This looks delicious. LOVE this! Found you on Flipboard and added this recipe. As soon as all this rain in Georgia stops, we’ll be overrun with okra, so… bring on the recipes! I haven’t had much experience with okra, but I’m so excited to try this recipe! Thanks for sharing! Really like this a lot. Although Okra is not my favorite, I do love it now and then but struggle with how to cook. Will try this for sure. Thanks. Great post. Mmmmmm! Roasted okra! That’s a great idea! That’s an ingredient I would love to use on the new grill! Agree. Love okra with curry for sure. I almost think it’s a fairly underrated vegetable. Great recipe. Will try this one. I have seen these strange looking veg in the supermarket and have never bought any because I was told they are slimy when cooked. Maybe I will try them your way and then make a judgement call. I have never tried okra before, but this recipe is giving me incentive to give it a go! Is there any specific right and wrong to purchasing okra? Just get the smallest okra you can find, make sure it doesn’t feel “woody,” and check to see that when you bend the tip, it snaps off rather than just bends. Very nice blog/site. I have only looked over briefly, and will look forward to spending more time in the future. I’ve never cooked okra before but that photo has made me want to try it. It turned out great! Very delicious! I LOVE the roasted okra and this will be a nice twist! I have tons in the garden now and thanks to your great site I started roasting it last year and now it is our fav way to eat it! We call them okra fries! And – okra is pretty filling too. And I completely agree about getting rid of the slime – it is GONE. I made these okra tonight and they were absolutely wonderful. Great and easy recipe! This is terrific! Made it into a meal by adding rice and navy beans, with additional salt, cumin, and garam masala. 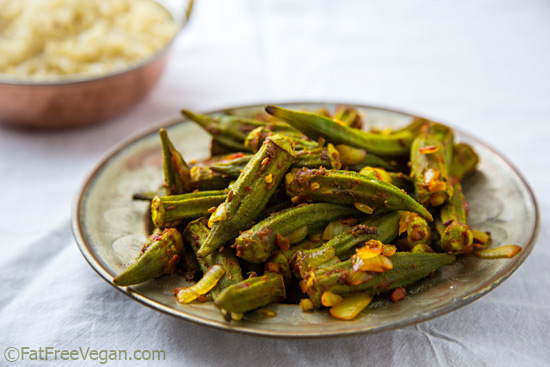 Okra what say in English but me being an Indian we say it ‘Bhindi’ and the recipe is ok and good with it. There are more recipes of it to make it more tasty and delicious.